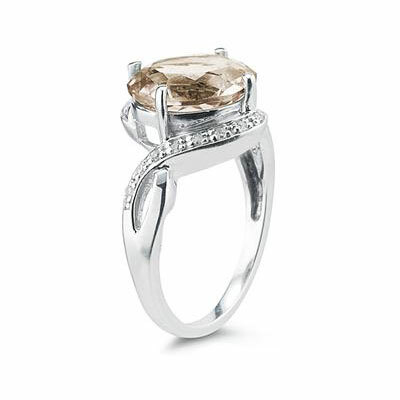 This Oval Smokey Quartz Diamond Curve Ring in 10K White Gold is undeniably sophisticated as it displays a gemstone with a subtle hue in a setting that seems to be set in motion. With a cool shine and elegant curves that call to mind a wandering breeze on a crisp fall day, this ring gently draws the eye and holds it with its mesmerizing soft sparkle and lively silhouette. 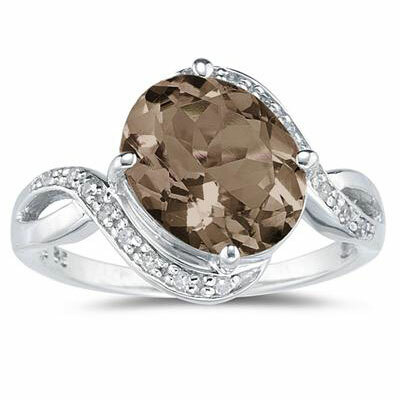 The starring stone of this gemstone and diamond ring is an oval-shaped smokey quartz, 11mm high and 9mm wide. This 3.10 carat semiprecious gemstone has, as its name suggests, an understated hue that calls to mind a wisp of smoke rising from an autumn campfire. 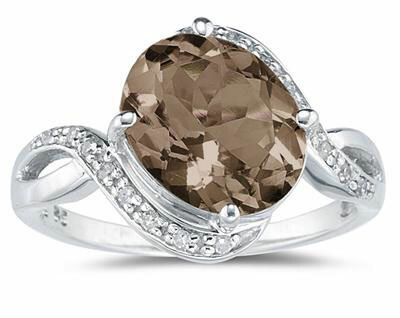 This soft brown glimmer renders this gem not only sophisticated, but also quite versatile, making this a ring you'll slide on over and over. Holding this smokey quartz is a band of 10K white gold that splits as it approaches this stone and that twists on its right and on its left to create a graceful spiraling design. Two arcs of diamonds (a total of .10 carats of glittering channel-set stones) accent this cool setting as they hug the center gem on the top and bottom like a sparkling embrace. We guarantee our Oval Smokey Quartz Diamond Curve Ring in 10K White Gold to be high quality, authentic jewelry, as described above.